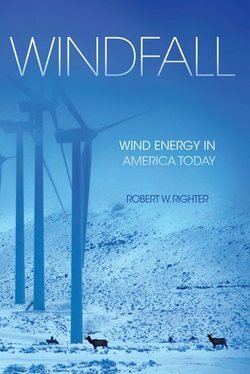 A new book, Windfall: Wind Energy in America Today, by historian Robert Righter, was recently published by University of Oklahoma Press. Righter also wrote an earlier history of wind energy, published by UofO Press in 1996. In the intervening years, of course, the wind industry has blossomed from its initial mini-boom-and-bust in the California hills (Altamont, anyone? ), with bigger turbines, larger government incentives, and growing commitment to reducing our reliance on fossil fuels (coal and natural gas) for electric generation all leading Righter to feel that an update was in order. No matter how admirable this is, should a few people pay the price for benefits to the many? Should rural regions lose the amenities and psychological comforts of living there to serve the city? Should metropolitan areas enjoy abundant electricity while rural people forfeit the very qualities that took them to the countryside in the first place? The macro-scale benefits of wind energy seldom impress local opponents, who have micro-scale concerns. The turbines’ benefits are hardly palpable to impacted residents, whereas the visual impact is a constant reminder of the loss of a cherished landscape. While some objections to wind farms are clearly economically inspired and quite political in nature, no one can deny the legitimacy of many NIMBY responses. When the electrical power we want intrudes on the landscapes we love, there will be resistance, often passionate. This is part of the democratic process. The vocal minority, if indeed it is a minority, has a legitimate right to weigh the pros and cons of wind development in the crucible of public opinion, in public hearings, and if necessary in our court system. Should the wind companies shoulder the blame? I believe they should. Good corporate citizens must identify potential problems and take action, and that action should precede final placement of the wind turbines….The most optimal ridge need not be developed at the expense of residents’ rights to the enjoyment of their property. Conversely, wind developers should give serious consideration to not insisting on raising turbines where they are not wanted…Unlike Europe, our nation has land. there are vast areas of the United States that have excellent wind resources and welcome the wind turbines….We can hope the industry will adopt the attitude of Bob Gates, a Clipper Wind Power vice president: “If people don’t want it, we’ll go someplace else.” Fortunately, the country can accommodate him. One might expect that this would preclude setbacks of less than at least a mile. But the industry prefers setbacks measured in feet rather than miles. Righter’s book also includes chapters addressing grid integration, government incentives, reliability, and smaller turbines. He repeatedly makes the case for more research and development into smaller, vertical axis turbines, which, even with their smaller outputs, could be far more acceptable in many locations where landscape disruption and noise issues are paramount. Anti-wind campaigners won’t find Righter to be very comfortable company, for he sees the technological and grid challenges as easily surmountable, and the government support and investment in the industry as both warranted and of proper scale. He also supports various efforts to achieve better community consensus, including making royalty payments to those not hosting turbines. Make no mistake, this is an avid supporter of the industry. Indeed, his long history and his deep knowledge of wind energy make his final recommendations about siting all the more striking. Righter’s experience and stance has fueled my confidence that the path AEI has been pointing to for the past year or so is more than the pipe dream of a tiny non-advocacy nonprofit. Larger setbacks, to protect unwilling neighbors from quality of life upheavals, combined with easements obtained via royalty-sharing or annual payments to neighbors who don’t mind hearing turbines a bit more often, is a fair and promising path forward. The days of an oil patch mentality of greed and boom-bust cycles are about over. Most developers understand that it is in their best interest to operate openly and in good faith with the local community. More problematical is the question of landscape. Wind turbines placed in a pleasing agrucultural, scenic, or historic landscape evoke anger and despair. At the heart of the issue is visual blight. Residents do not want to look at the turbines and are willing to fight wind development. Their wishes should be respected. Wind developers should take to heart geographer Martin Pasqualetti’s advice: “If developers are to cultivate the promise of wind power, they should not intrude on favored (or even conspicuous) landscapes, regardless of the technical temptations these spots may offer.” The nation is large. Wind turbines do not have to go up where they are not wanted. We can expand the grid and put them where they are welcome.